Millions of pounds of investment in HMNB Clyde is set to bring jobs, transport, leisure and business growth opportunities to Helensburgh, with an agreement signed today (February 27) between the UK Government, Royal Navy and Argyll and Bute Community Planning Partnership. 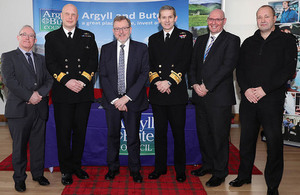 HMNB Clyde have signed an agreement with Argyll and Bute Council to work together in delivering infrastructure and opportunities for Royal Navy families and local people. The UK’s entire submarine fleet will be based at Faslane by 2020. This will reinforce Scotland’s vital role in protecting our country, and guarantee skilled, secure jobs on the Clyde for years to come. We must ensure this investment in the base is also a catalyst for growth and regeneration in the wider community. Today’s agreement will deliver new housing and improved infrastructure, ensuring people in Argyll and Bute benefit directly from hosting the base. This agreement ensures the investment we are making to upgrade HMNB Clyde, as part of the £1.7bn we are spending to improve military bases in Scotland, will not only help provide our people and their families with more stability and a better environment to work in, but will also help transform the local area, providing skilled jobs and better infrastructure. This agreement is about making the development of HMNB Clyde work for Navy personnel, their families and the communities in Argyll they will be joining. It’s about delivering opportunities for new residents and local people to build happy, prosperous lives together. Helensburgh and its surrounding areas offer great benefits as a place to live, work and visit, and we very much look forward to welcoming new Navy friends and neighbours. Work will focus on key themes which are set out in a Strategic Delivery and Development Framework (SDDF) and include education, economy, community facilities, communication, transportation and housing. The Royal Navy is keen to ensure that the local community better understands what it brings to Argyll and Bute. There are tremendous opportunities for mutual benefit, such as our redevelopment of the Drumfork Club in Helensburgh, building new sports facilities and the UK Government £5m of support for the Council’s waterfront redevelopment. Through its redevelopment HMNB Clyde will grow its staff numbers from 6,800 today to an eventual population of 8,200. The construction phases are expected to support a further 1,000 contractor jobs. Economy and regeneration: On 18 January 17, Argyll and Bute Council and HMNB Clyde held the first joint economic forum in Helensburgh. Local businesses were invited to hear about the tremendous opportunities available from the expansion of the Naval Base. Following the event the Council is collating findings and developing a plan of action to take forward. Housing and Accommodation: The MOD and Council are working with private and social housing sectors to develop options for choice in the housing market. Education and training. Argyll and Bute Council has created the role of Service Pupil Adviser to provide advice and support for the large numbers of Armed Forces children in the Helensburgh and Lomond area. This temporary post is funded by the MOD Education Support Fund. The MOD owned Drumfork Club, situated in Churchill Estate in Helensburgh, is currently being renovated and due to be re-opened mid-2018. The refreshed facility will be open to the entire community and feature an area for registered childcare provision and five multi-purpose function rooms which can be used for organised and semi-organised activities by local community groups and organisations. Although many of the Royal Navy facilities in the area have been put in place for use by service personnel, base workers, and their families, the facilities are also made available on a regular basis to local community groups and organisations. Communications and engagement. The MOD and Argyll and Bute Council have produced an Armed Forces and Veterans’ brochure which will provide information on Argyll and Bute and the various organisations and services available to support the Armed Forces community and their families.